For Women’s History Month, CUESA is spotlighting women who are transforming our food system. This week we introduce you to two successful women entrepreneurs who recently joined the Ferry Plaza Farmers Market: Jen Musty of Batter Bakery and Rachel Saunders of Blue Chair Fruit Company. Jen Musty has gravitated to the kitchen for as long as she can remember. “Ever since I could sit on the chair next to the counter, I was baking with my mom,” she says. Growing up in Tucson, she was always the kid who brought homemade cookies to school to share on Valentine’s Day. She remembers cooking a whole day of meals for her family when she was just 12 years old. It only seems natural that baking is now her business. 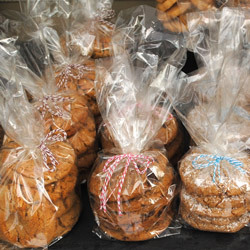 Batter Bakery’s seasonal cookies, cakes, and other treats taste like a lifetime of practice went into perfecting them. But the journey took much more than just sugar and spice. After graduating from high school, Musty moved to the Bay Area, where she studied accounting at Santa Clara University, and then landed an accounting job in San Jose. Sitting at a desk all day, she found herself fantasizing about what she would bake when she got home and dreaming of opening her own business. When a former coworker gave her a catering gig, the wheels were set in motion. With no formal culinary training and no experience in the food industry, she dove right in. In 2006, she quit her office job and started working at the recently launched Blue Fog Market in San Francisco as a product buyer, which gave her a crash-course in running a small food business. On the side, she started building a name for herself as a caterer, using shared kitchen spaces to produce baked goods for events. In 2009, she opened a kiosk in downtown San Francisco to sell her original cookies, scones, shortbreads, brownies, and cakes, and a couple years later she launched a brick-and-mortar kitchen and storefront on Polk Street. She is still driven by a love of sharing good old-fashioned American treats, and the Bay Area exposed her to a whole world of flavor possibilities. “New recipes will come to me when I’m wandering around the farmers market and seeing what’s new, or finding some variety of fruit I haven’t used before,” she says. At her Saturday market stand, you’ll find everything from devil’s food brownies to Batter’s signature Sand Angels cookies (a secret recipe) to market cakes inspired by the seasons (expect lots of strawberries this spring). Batter’s “Sweetcart” keeps the cookies at that perfect fresh-from-the-oven temperature. Preserves maven Rachel Saunders is a firm believer in the “10,000-hour rule” popularized by Malcom Gladwell: to achieve mastery in a field requires practice­­, and lots of it. 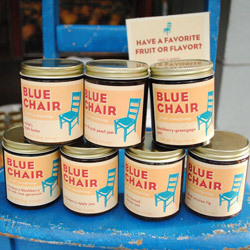 Her Blue Chair Fruit Company represents countless hours in the kitchen, and just as many jars of jam and marmalade. Saunders is on a mission to elevate preserve making to the status of high cuisine, with locally sourced and sustainably grown fruit as the star. “I see a jar of jam as a finished dish in a restaurant. It has complexity and balance, but it’s also really clear what you’re eating, and really beautiful,” she says. A native of New York State, Saunders moved to San Francisco after college. She became a regular Ferry Plaza Farmers Market shopper at its former Green Street location, where she fell in love with the diversity of delicious produce the Bay Area has to offer. She started researching preserves at the library, recreating old recipes in her home kitchen. While working at restaurants and cafés, she sold her homemade jams under the table, as her interest grew into an obsession. “It became clear that I had to start a business because it was way more than a hobby,” she says. In 2008, she launched Blue Chair Fruit Company in Oakland and officially began selling her jams, fruit butters, and marmalades at the Temescal Farmers Market. Nearly all of the fruit Blue Chair uses is sourced directly from local farmers, with an emphasis on organic produce and unusual varieties, utilizing surplus when possible. “We think it’s important to enable the farmers to diversify by showcasing the whole range of what they can grow,” says Saunders. She sees Blue Chair’s preserves as an important link between farms and the public, by helping eaters taste peak-season fruit in a new and delicious context. For example, her jam made with Blossom Bluff Orchard’s Peacotums (a peach-apricot-plum hybrid) helped introduce the unfamiliar variety to a new audience. Today Saunders and her small kitchen crew, including sous chef and long-time collaborator Jo Huynh, create more than 100 flavors a year. Selections range from elegantly simple single-flavor jams (boysenberry, Greengage plum, Dirty Girl dry-farmed tomato) to distinctive and complex marmalades (bourbon’d lemon, Rangpur lime with zucchini, blood orange-chestnut honey with rosemary). Since she started Blue Chair, Saunders has shrewdly built her company’s brand while remaining true to the artisan values so close to her heart. In 2010, she released The Blue Chair Jam Cookbook, an acclaimed modern primer on jam and marmalade, and last year she followed it up with Blue Chair Cooks, a guide to cooking with preserves. She currently teaches an online course that has thousands of students from around the globe. Blue Chair now has national distribution, but you’ll still find Saunders at the farmers market dressed in retro style, standing proudly behind a selection of handcrafted preserves displayed on little blue chairs. Each jar is a loving ode to a season past, an homage to hours of labor in the field and in the kitchen. Look for Batter Bakery and Blue Chair Fruit Company on Saturdays at the Ferry Plaza Farmers Market. 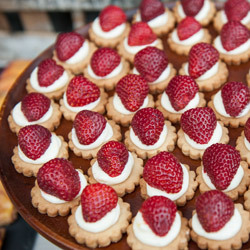 Strawberry tarts photo by Tia and Claire Studio.